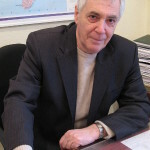 Authored by the Head of Geoecology and Exploration Research Department of Institute of Geological Science of National Academy of Science of Ukraine Mr. Igor Bagriy, PhD in geological science. The development of Ukrainian coal industry directly depends on the successful solution of coal layers degasation problem and eliminating the risk of gaseous-dynamical events (GDE). The increase in the depths of coal extraction leads to more complicated geological conditions, namely to the lower stability of mine tunnels, changes in stress-strained state of geological formations, increase of gas presence and the risk of outbursts. The largest economic and social losses are caused by GDE: unexpected outbursts of coal, rock and gas; mine bumps, sudden rock slides, gas emissions and coal outsqueezing. GDE cause emergency situations and fatalities on coal mines. While moving into deeper coal horizons gas conditions in mine tunnels (emissions of methane and other gases) become a major factor, which significantly impacts the safety of works and deter coal extraction operations. Out of 200 mines in Ukraine 85% have dangerous gas conditions. Therefore, one of the most important tasks during coal extraction is ensuring the safety of operations by removing of methane from coal layers in production mines and also from the formations, where coal deposits are planned to be developed. Besides causing dangerous working conditions, health and fatalities risk for coal miners methane emissions into the air also lead to serious deterioration of environmental conditions, primarily to atmospheric air pollution and strengthening of greenhouse effect. The share of methane in overall greenhouse gases emissions in Ukraine constitutes to 35%. In turn, methane emissions from coal production constitute to 80% of all methane emissions in energy sector of Ukraine. The main sources of methane emissions during coal extraction are ventilation and degasation systems. Despite the undeniable progress in the development of theoretical and scientific framework to combat dangerous GDE, the problem is still unresolved. The number of unexpected outburst of gases and rocks is growing, resulting in serious economic losses, and most importantly – to fatalities among coal miners. Without substantiated theory of the origin and development of GDE the focus on specific indicators of composition, properties, gas saturation, deformation stress and tectonic displacement of coal layers and surrounding rocks has not yet allowed developing of reliable methods to predict dangerous events in mine tunnels. To a large extent this is due to the lack of comprehensive studies of geological conditions of various GDE occurrences in the mine tunnels and at the blocks, where geological exploration works are planned. The results of such studies should be a basis for explaining the nature and mechanisms of GDE and relevant predictions with respect to potential locations of their occurrence. At the same time, taking into account the deficit of energy resources in Ukraine Donetsk coal basin is treated as a major gas-bearing region with the perspectives of identification and development of gas fields. During coal extraction more than 2 billion cubic meters of gas (methane) are emitted annually, however only around 200 million cubic meters are utilized (less than 30% of total captured methane volume), while the rest part is burnt on flares. At the same time, the experience of dealing with coal seams gases shows that commercial production of coal bed methane in Ukraine is now realistic. The good example of complex solution of methane degasation and utilization for heat and power generation could be the project realized on coal mine Mine named after A.F.Zasyadko, where the energy complex based on cogeneration units was commissioned on Tomashivska Pivdenna mine. There are two ways of methane utilization. The first one is the drilling of the well and methane extraction with its further pipeline transportation to consumers. The second way is the drilling of small wells in the zone of produced coal field till the depth of coal tunnels. Such wells are connected via pipelines with the flare or cogeneration unit, where gas is burnt. At the current stage of coal basins development coal seams methane could be used as a separate, unconventional, relatively available and environmentally safe hydrocarbons source, extraction of which could not be tied to the operation of coal production mines. The first rank measures for the degasation of coal seams of existing mines, extraction and utilization of methane from coal seams on a complex basis of modern technologies are the following: 1) strengthening environmental protection measures; 2) increase the safety and efficiency at coal extraction sites; 3) definition of real gas saturation of prospective coal fields, where extraction and utilization of gas (methane) could be ensured by drilling the wells from the surface. Necessary information could be gathered by inclusion of express and low cost research methods into exploration process. Such methods include complex of structural-thermo-atmogeochemical research (STAGR). The complex is based on new scientific, methodological and practical developments patented and registered by the State Department of Intellectual Property of Ministry of Education and Science of Ukraine. 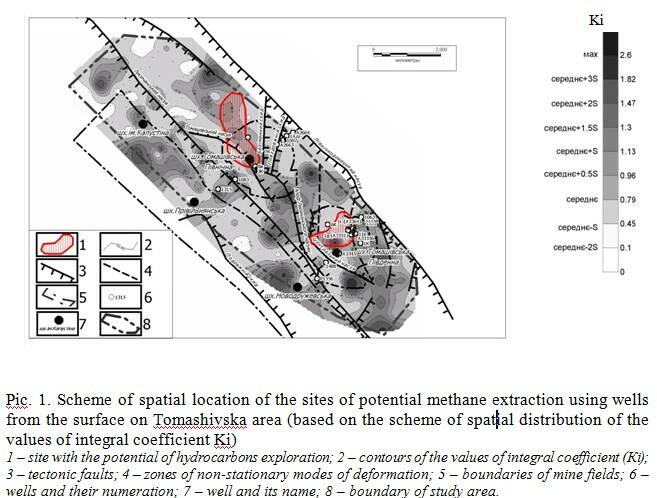 Based on the results and analysis of materials and data on a wide range of problems connected with gas saturation of Donbass coal deposits the authors have chosen several representative areas for carrying out complex structural-thermo-atmo-geochemical research, in particular Tomashivska area and Krasnolymanska area, as well as fields within mining license of Mine named after A.F.Zasyadko. The goal of the studies was to define the areas and sites with increased gas saturation and degasation within the boundaries of operated mines’ fields and abandoned mines’ fields, mapping of geodynamic activity zones both of natural and anthropogenic origin and locations of potential occurrence of dangerous geodynamical events, evaluation of geoenvironmental conditions. According to STAGR results on Tomashivska area and based on the results of analysis of the complex data on its geological structure, structural location and gas bearing capacity within Tomashivska arches the prospective sites for the exploration of hydrocarbon gases (methane) and methane extraction using wells from the surface were identified for the first time. Implementation of complex works on these areas allowed localization of gas emitting zones on the surface with further utilization of methane in order to reduce its emission into atmospheric area and improve environmental situation. Due to utilization of methane, emissions into atmosphere were reduced by 176 thousand tonnes in CO2 equivalent. Till 2014 emissions were additionally reduced by 429 thousand tonnes in CO2 equivalent. Mapped with STAGR methodology prospective areas demonstrate significant concentrations of heavy hydrocarbons, helium and hydrogen. The authors believe that this fact provides grounds for more in-depth studies with the potential of large hydrocarbons deposits discovery in this region. Only for Tomashivska Pivdenna mine estimated reserves are higher than 40 million cubic meters, while the amount of methane in deeper horizons till the depth of 100 meters exceeds 300 million cubic meters and the reserves of methane in the deep layers till the depth of 1000 meters could be equal to several billion cubic meters. As it was mentioned above, the problems with coal seams methane have also the environmental aspect, in particular with respect to the growing global greenhouse gases emissions and climate change, pollution of atmosphere and other components of environment. pre-mining prediction of gas saturated areas in production coal headings for the construction of ventilation equipment and wells. 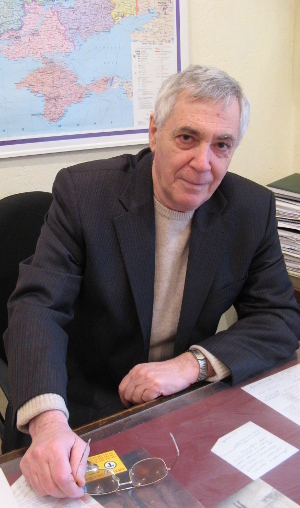 Based on the research results the scheme of spatial location of the areas prospective for identification of hydrocarbon gases (methane) deposits on Northern and Southern areas of Mine named after A. F. Zasiadko was developed. The locations, which could be used for extraction of methane in industrial volumes, were identified within the study area. Furthermore, the locations of potential GDE occurrence on the geodynamic activity scheme completely correspond with the mapped areas of hydrocarbon production based on both the surface and lateral studies. In case of gas extraction from prospective areas the geodynamic pressure will be considerably decreased and, consequently, the risk of GDE occurrence will be lowered. 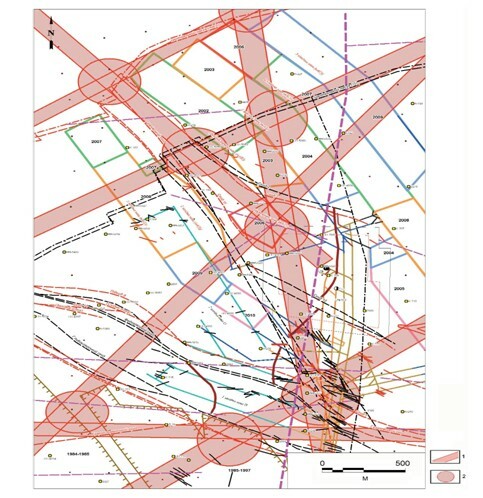 As it was stated above, GDE strictly correspond to the criteria of prospective zone and areas based on STAGR methodology (impermeable areas, increased temperature, the presence of helnium, hydrogen, significant Hall effect of hydrocarbon gases during construction of integral aggregated maps). 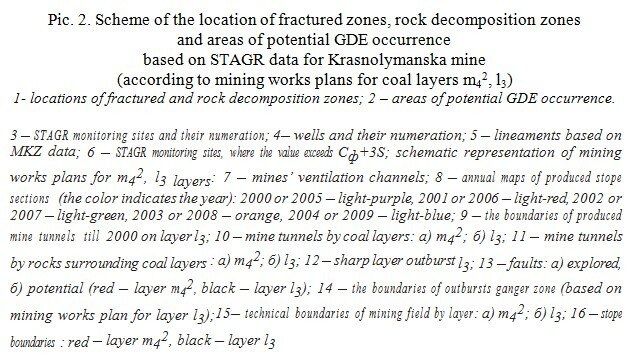 As a result of performed studies, the feasibility and efficiency of STAGR methodology introduction during elaboration of coal deposits structural models, identification of the coal fields sections prospective for methane production using wells from the surface, mapping of increased degasation zones within the mine fields, zones of potential GDE occurrence and solving of other practical tasks was proved. 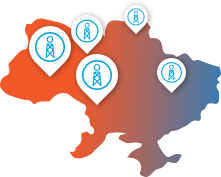 Based on our research works recommendations for the introduction of STAGR methodology during geological exploration and exploitation works on coal fields of Donbass region were developed.